Back in November we told you about World of Warships developer Wargaming.net teaming up with Project V.A.L.O.R to try to save the USS Texas, a New York class battleship used during both WWI and WWII that is in need of serious repair. The ship is literally sinking — taking on an average of over 300 tons of water per day. To prevent the loss of this historic vessel, a team consisting of engineers, preservationists and historians want to move the ship to dry dock before she sinks and repair her. This is an endeavor that would reportedly cost around $51 million. At the time of our initial post, we told you about several packages that the company would be offering players for purchase, with 100% of the proceeds going to the repair effort. That particular set of bundles was set to expire on December 1. Yesterday, the company updated players on their progress, noting that so far, they have raise more than $280k worldwide. Obviously this is just a small junk of the amount of money needed to help repair the ship. So, Wargaming.net has decided to extend their fund raising efforts. Starting today, the developer is offering players a special deal on their Invite-a-friend program. 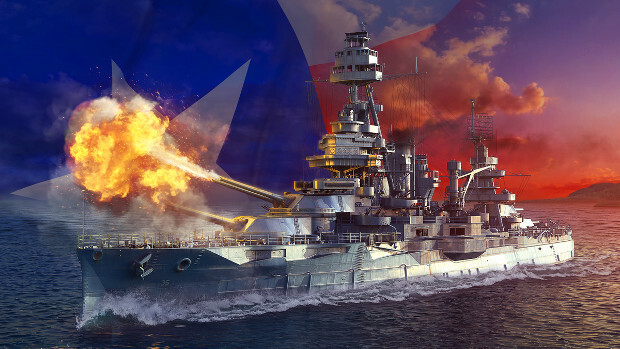 Between now and April 1, 2018, the company will not only give referring players and their invited friends special bonuses, they’ll also donate $25 for every new recruit that hits tier VI to the Battleship Texas Foundation. There are a few stipulations on this deal — the most most important of which being that it only counts for players who accept an invitation following the announcement of this program. The fine print can be read on the official announcement if you’re interested in helping.